I love clawfoot bathtubs, although they are a bit difficult to get out of with cranky knees. When I was a child, I used to love to go to my grandparents home because they had such a cool clawfoot tub. My daughter's family has one in the 1800s farmhouse they recently purchased. They have been discussing ways to add a shower to it as it stands out in the room away from the walls. I just love to see how other people incorporate them into their vintage bathroom decor. I love that they have left this one with its vintage wear on the sides. If you don't have to worry about peeking neighbors, this is a lovely way to go. This looks like a great way to add a shower. Wow, this is kind of the ultimate isn't it? Just a nice old fashioned feel to this. as I'm sitting here dreaming about bathtubs, I am noticing the dust that seems to be accumulating on my furniture. Guess it is time to do something about that. Have a great day. I've always loved clawfoot tubs...there is something so romantic about them. If we ever renovate our bathroom I'd love to install one! I LOVE them too! I like your style. New follower. I've wanted a claw foot tun forever, but will probably have to wait until, and if, we ever move. I did see one once positioned in the center of a bathroom which I've always thought was amazing! Post near to my heart. When I was young I rented house, just because it had a claw foot tub. Never mind it was old and drafty. I've always wanted a claw foot tub, especially one of the ones with the high curved backs. Could totally see renting a house just for the tub! Oh, I do love those old clawfoot tubs. My ex-M-I-L had one in her bathroom. Love clawefoot tubs - they look so relaxing! 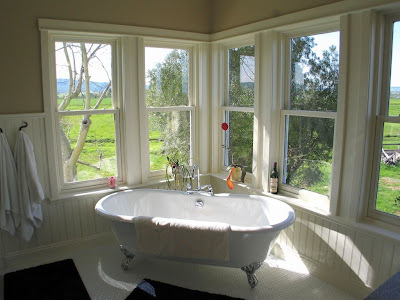 The picture of the tub with the windows (make sure you don't have any close nosey neighbors!) looks like it would be the best place in the house! You have an inspiring blog. Home interior designing is so much fun. New follower from Follow Friday over 40! i have always loved claw foot tubs -- the deepest baths you will ever take! Thanks for the follow – i already follow you on gfc -- so happily returning the bloggy l♥ve on fb & twitter! My grandmother used to have one. They are so relaxing to soak in for hours. Thanks for following and I'm following back. I so love your ideas and pictures. Out of all I looked at tonight I love the garden table. I like vintage items, not always the antiques but useful vintage. Thanks for stopping by. I love this post!! The photos you've put together are brilliant, my favourite is the last one for sure. Hope you are well & apologies for delay in responding to your comments on http://westegg-interiors.blogspot.com/2011/09/apple-walnut-cinnamon-muffins.html I've been swamped. Added you to my blogroll, have a lovely week ahead. I have never been in a claw footed bathtub but from the comments it sounds wonderful! They are gorgeous to look at. Returning the follow. Thanks for coming by and commenting. One of my closest girlfriends has a clawfoot tub in her master suite. It is so cute. Picture perfect. Returning the follow. Thanks for stopping by my blog.